Howard was born in 1966 in The Pas, Manitoba. He is a Cree Indian and grew up in South Indian Lake in Manitoba. He started carving in wood when he was eight years old. He enjoys making snowshoes and toboggans out of birch trees. He has now been carving in soapstone and alabaster for several years. 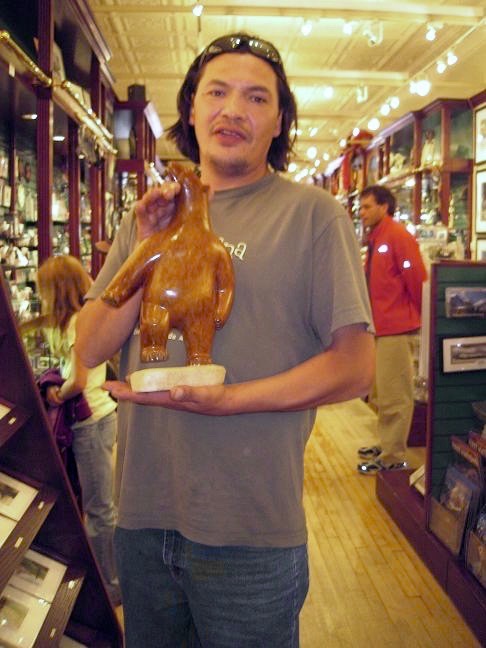 His favorite carvings are of bears although he carves birds and other animals as well. His Lake Manitoba alabaster bears reflect his love of the animal as he captures them in a quiet, pensive and relaxed mood. The large limbs and body capture the powerful essence of the bear. Howard is married with three children. Click this link to see Howard's carvings.